Introduced by Morgan Fisher. Curated by Stoffel Debuysere and Maria Palacios Cruz. The 16mm films of Morgan Fisher (US, 1942) – straightforward, elegant, playful – are particularly idiosyncratic; they are situated both outside the film industry and the central developments of avant-garde cinema. Too minimal and conceptual for Hollywood’s taste; too concerned with the specifics of industry procedures for the underground. Although born in Washington DC, the work of artist and filmmaker Morgan Fisher is essentially Californian. The kind of crossover between avant-garde cinema, film industry and contemporary art in which his films operate could only occur in a city like Los Angeles. After earning an art history degree at Harvard in 1964, Fisher moved West to teach and study at USC and UCLA, where an interest in film was then taking hold. While teaching, he began his career as an editor in the commercial film industry, an experience that would mark his subsequent work as a filmmaker, leading him to examine and deconstruct with wry humour the machinery of cinema in his films. In a sense, Morgan Fisher’s film work is one of the most accomplished forms of filmic meta-cinema. Films that are themselves a discourse on cinema, and which could be understood as “moving” history and theory of film; critical texts in the very form of their object of study. If avant-garde film has always hold this critical function of discourse on film’s history and its possibilities, nowhere it is more apparent than in Morgan Fisher’s oeuvre. And yet, Morgan Fisher’s work has often been marginalised for not fitting neatly into any of the usual avant-garde categories. Instead of avoiding commercial approaches, Fisher uses avant-garde procedures as a way of engaging mainstream film. This programme brings together a selection of Morgan Fisher’s films, rarely seen in Europe and most of which will be screened in Italy for the first time. Beginning with Fisher’s first work as a filmmaker in 1968, The Director and His Actor Look at Footage Showing Preparations for an Unmade Film (2), the selection spans two decades of work, between 1968 and 1984. In 2003, after a 20 years hiatus away from filmmaking (occupied with painting and drawing) Morgan Fisher completed ( ), a film comprised entirely of insert shots. It will be screened on the (DE)CODING programme on November 5th, together with — ——- by Thom Andersen and Malcolm Brodwick, the title of which ( ) references and pays homage to (Andersen and Fisher are long time friends and collaborators). A film in 5 sections; each of them is a single roll of 16mm film long. We see a bare room with a young man sitting behind a tape recorder. Another man, played by Fisher himself, busily enters; he tests the recording machine and eventually goes into a back room, which, when illuminated, turns out to be a projection booth. Each section of the film elaborates the situation of the director and his actor working on an unfinished film which gradually becomes the film we are watching, but which is not the film they were working on. Throughout we hear the comments of the two men as they watch the rushes of their film. Watching rushes is part of the necessary procedures of the fimmaking process, which must remain invisible in the finished film. In this work, however, procedure itself is the subject. Just as The Director and His Actor… (made also in 1968) Documentary Footage deals film process, but as the title indicates, it refers to documentary film and not narrative fiction. A single continuous shot of 11 minutes (a 400 foot roll of 16mm, the measure of many of Fisher’s films) in which a naked woman turns on a tape recorder and reads a series of written questions, then rewinds the tape and proceeds to answer to the questions she previously read, all of which concern her body. Documentary Footage reveals the impact of the film process on the woman who is the subject of the film, showing the changes in her manner when she first reads the questions and when she answers them. As its title indicates, the subject in Production Stills is a series of production stills of a film that was never made, and that at the same time is the film we are watching. Scott McDonald calls Production Stills “the quintessential Fisher film”. 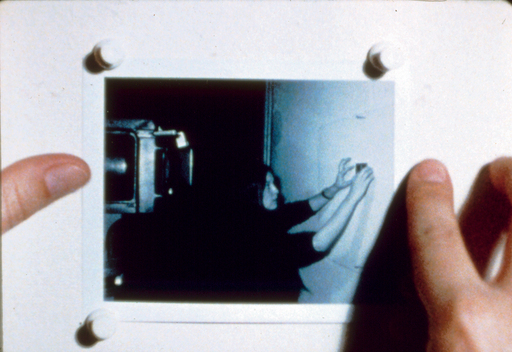 A perfectly enclosed narrative of its own production: the image is one long take (again 11 minutes) of a wall on which a hand sequentially pins a number of Polaroids, one after the other. The Polaroids depict the crew making the film; the synchronous sound allows us to hear in ‘real time’, their chatter and the hum of the still camera, so that we can anticipate the photos and assign faces to the voices we hear. Picture and Sound Rushes deploys the various combinations of sound and image in cinema. Again, Fisher unveils and explains film strategies and structures, breaking, and the same time re-imagining, the illusion of cinema. Fisher reads a text that describes the industry procedure of double-system sync sound recording which allows sound and image to be recorded separately but in synced sound. Once again, Fisher approaches a subject unusual for the avant-garde, double system being very rarely used by experimental filmmakers. “Over the years Morgan Fisher has analysed nearly every aspect of the production and projection process. Cue Rolls appears to be a continuous five-and-a-half-minute shot, the visual subject of which is a synchronizer through which four strands of black and white leader are running continuously. As the soundtrack makes clear, Fisher has applied what once was a standard industry practice (for making colour corrections and other modifications before final prints were struck) to a situation in which it would seem to be entirely irrelevant. Specifically, a single continuous forty-foot shot of four strips of leader moving through the synchronizer was “analysed” into ten-foot segments that were subsequently A and B rolled so that the ten-foot segments could be resynthesized into a convincing illusion of the original, uncut shot. The leader moving through the synchronizer was a plan for the negative cutter who would edit (or who, by the time we see the film, has edited) Cue Rolls“. (Scott MacDonald). Cue Rolls suggests that the particularity of cinema is its interface of rigorous mechanical equipment and fallible human process, which is dramatised by the juxtaposition of the precision mechanics of the visuals and Fisher’s somewhat halting narration. Morgan Fisher makes films that “return you to the here and now, and in so doing give you back the body that all other films take away from you” (Morgan Fisher). With Projection Instructions Morgan Fisher turns his interest to the screening space and the act of projection. 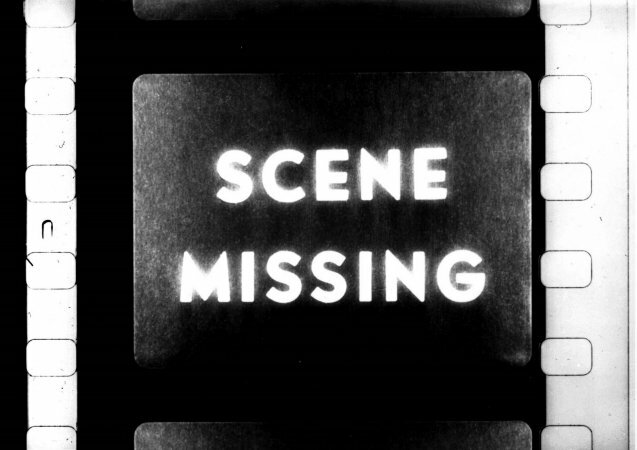 Every film must be performed by the projectionist, but generally the projectionist’s job is done correctly when it goes unnoticed. Projection Instructions puts the projectionist at the centre of the work, requiring his full attention, as all the textual instructions on the screen (“Turn sound off”, “Throw out of focus”…) need to be read and respected. An autobiographical account of Fisher’s experiences as an editor in the commercial film industry during the early seventies. Filming a succession of divergent film scraps rejected at the editing stage, Fisher comments on the origin and meaning of each image, thus exploring the mechanisms and conditions of film production, in both its materialistic and institutional aspects.